9:00 AM and our clinic is filling fast! I love when our reports are written by our volunteers–their perspective is often unique and I love to have their voices added to support our project, but today I want to personally share an experience with you all. We visit about 25 communities spread over 7,000+ square miles of jungle-covered mountain and mangrove island mazes. Some of the communities are a shorter boat ride from our base, but some are VERY far away–and the Ngabe community of Rio Caña, where we went last month, is the furthest community we currently visit, on the exposed, open-ocean side of the Bahia Azul peninsula. Rio Caña is about 70 miles by boat from the nearest small community hospital, and VERY hard to get to–it requires a lot of planning and the willingness to endure pretty bad weather and rough seas to get there. It is about 6 hours in a huge dugout canoe, at the end of which there is a treacherous river entrance blocked by a sandbar with big surf. I know longboard surfing is widely popular, but until you have surfed a 50′ hollowed out log down the face of turbulent waves to enter the Rio Caña, you have not truly longboarded. 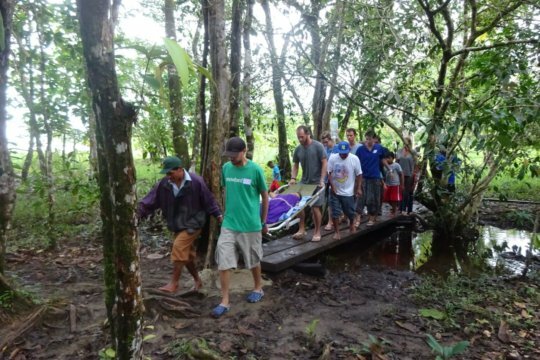 In this community, small emergencies are almost always big emergencies–because the chance that the patient may be able to travel to help is VERY low–at best, the trip would cost more than most families live on for 2 months; at worst, bad weather and 15-foot seas make the trip a complete impossibility even if you were a millionaire. These are the communities we specialize in serving–the ones where a lot of people see a doctor for the first time in their lives when they come to our clinic. On this visit, there were several ‘small’ emergencies–a horribly infected ax wound on a young man’s foot, a young girl with acute appendicitis, a young boy whose entire scalp was an infected mass of pus and fungus…the list goes on. All of these things are dealt with in more developed regions by a trip to the family doctor or to the emergency room; here, they are treated mostly with hope, which unfortunately is not always enough to prevent a terrible outcome. 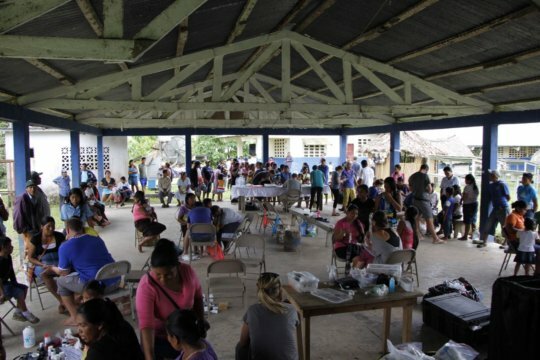 We saw 250 patients, pulled about 60 abscessed teeth, performed ultrasounds on about 25 pregnant moms, and made sure the ‘small’ emergencies STAYED small and were dealt with promptly. No one who has not shared a journey to distant communities like Rio Caña can truly understand what it takes to make it out there and to provide good health care so far from the comforting presence of a nearby hospital with specialists and advanced services, but if we don’t go out there…the young man loses his foot (and perhaps his life); the young girl’s appendix ruptures and she dies, the young boys’ scalp infection poisons his blood. This is why our volunteers endure such hardships to get there, and why we go to such great lengths to reach these communities. I wanted to write the report myself today because I wanted to bear witness both to the courage of our patients, and to the dedication and endurance of our medical teams. Am I a hero? Absolutely not–but I am privileged to work with heroes every day. Hope in Rio Caña and other communities is no longer the only care available. 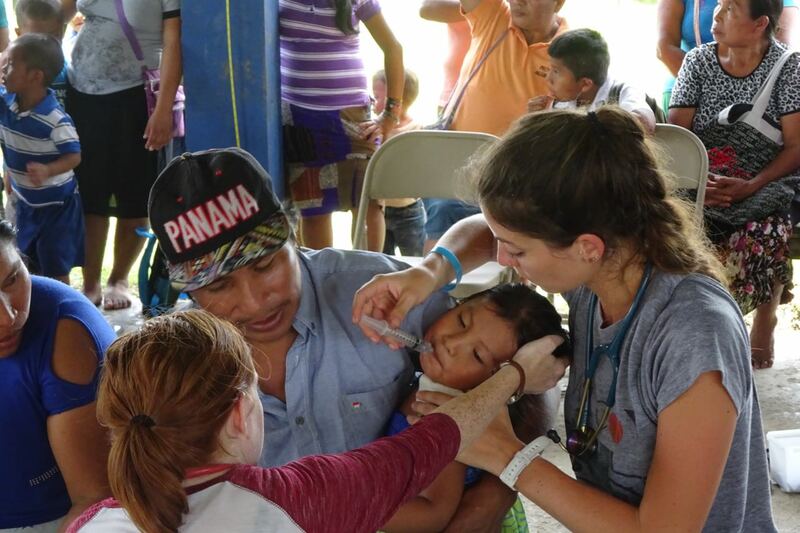 The health care our volunteers provide is some of the most loving, caring medicine I have seen anywhere in the world. In 2016, the infrastructure we have worked so hard to build this year will more than double our capacity. It has been a tough journey to get this far; traveling to Rio Caña is like a microcosm of the journey of our organization. When I look back at how far we have come in such a short time, the daunting challenges in the future suddenly don’t seem quite so insurmountable.